Jay responded: "The ST L7805 is a voltage regulator that steps down the 30-volt power supply to five volts for the TC2000 controller. The output stages of the TP2050 chips are powered directly from the 30-volt SMPS. Bridging the two channels on the TP2050 doesn't really do much for 8-ohm power output as this is limited by the supply voltage, not current. Where it makes a difference is in driving difficult loads at lower impedances. At lower impedances, current is king and the included SMPS is the limiting factor. It is rated at 100 watts continuous output. With about 90% efficiency, 45wpc is the maximum theoretical continuous power output. On intermittent peaks, one can get over 75wpc. I have toyed with the idea of a battery supply which would allow 75wpc continuously. The problem is that SLA batteries are large, heavy and full of hazardous materials. Such a supply would be huge compared to the amplifier itself, and its small size is appealing to many customers. The included SMPS is suitable for laser printers and similar products which call for peak power that is considerably higher than average. This fits well with music which has peak demands much higher than average." Mark Jay's words. We're going to come across the power supply issue again which is directly related to my unusual audition findings. I also have found an alternative to SLA batteries that might interest those who prefer music making off the grid. Now the audition software. Pianists since Mozart were wonderful improvisers, a tradition now sadly sinking into oblivion. John Bayless is one of the endangered species whose repertoire transverses Bach, Beatles and Bernstein in addition to Romantic classics. No offense but jazz improvisers compared to Bayless are mere charlatans. He is the real symphonist of pianists. He turns the 88 keys into a 100-strong orchestra, with passionate cantabile melodies soaring through the upper and lower credenza-like dazzling ornamentations that you'd swear the man has three hands. If you shed tears on hearing Puccini arias, get yourself a box of Kleenex before you cue up this CD. The pathos he conjures up sends shivers down my spine each time. Richard Strauss' youthful works are so unlike his matured works - more romantic. When this great 20th century symphonist composed in the traditional Romantic vein, he triumphed like Brahms and Schumann. Skillfully played with in-depth musicality by the Korean virtuoso violinist Sarah Chang, with her mentor Sawalisch at the helm, this recording is also a satisfying sonic treat. Carreras needs no introduction. Luciano Berio is one of the most celebrated contemporary composers, orchestrators and conductors of this age. Though a modernist and electronic music composer, this CD showcases his more restrained orchestration style, which adds depth and breath, fires and sparkles to the most beloved works of Verdi and Falla. Recording quality is one of Philips' best. If you think Baroque music played on period instruments is trite, Rameau is going to change your mind forever. The French composer was the forerunner of programmatic music as exemplified in his operas written for the royal court theatres. His many dances, scenes of volcanic eruption and storms at sea are charged with blazing orchestral energy and descriptive vividness. This recording is of critics' choice caliber. Through the many months of audition, the Mouse has actually gone through more software than any other amps I have reviewed. The above four titles are conveniently cited for the more tangible attestations of my report. The reason for such overwhelming enthusiasm is simply due to the fact that this little box is sonically greater than its physical embodiment and I had to keep elevating the stakes in terms of speaker matching. Conservatively rated at 30/45wpc into 8/4 ohms, with 0.05% THD+N as per Winsome Labs' website, the Mouse didn't get me too excited at first. (Output figures published in the Tripath datasheet are far better than this but that of course is based on their own evaluation board measurement rather than a production amp in the field.) To begin with, I set it up in my smallest room like all the other Tripath-based amps. Hooking up the Mouse with my official Tripath amp monitor the Loth-X BS-1 was exciting enough. I instantly sensed a grander presentation of orchestral power yet had doubts that the potency was somehow curbed by the speaker's -3dB 70Hz bass response limit. After all, we had 30wpc on hand, why confine ourselves to 94dB efficiency? Matching the Mouse to my 84dB/4-ohm Dynaudio Facette seemed too sudden a jump however. This hard-nosed Danish mini floorstander has been very unkind to a lot of amps. From my own experience, only the Symphonic Line RG3 & RG4, simaudio Celeste W4070SE and more recently the NuForce Reference 9 made it sing. I particularly like the NuForce with the Audio Zone Pre-T1 passive preamp, a combo which yields an unimaginable balance of tonal coherence and imaging clarity. All of these successful suitors have either exhibited a wealth of high current or tight-fisted control through high damping factors to win the heart of the Facette. Would the humble little Mouse stand any chance? I had to believe in love at first sight. In the eyes of the Facette, the Mouse had turned into the Prince. The Puccini Album: Arias for piano was remarkable beginning to end. "Non piangere, Liù! ", "Nessun dorma!" and "In questa Reggia" from Turandot, "Une bel dì" and "Tu, tu piccolo Iddio!" from Madame Butterfly were rendered with full-blooded passion and keyboard fireworks. "O mio babbino caro" from Gianni Schicchi and "E lucevan le stelle" from Tosca were imbued with yearning desire and pianistic lyricism. 'Orchestral' colors were flying. Bass was deep. Perhaps textures were not as fine as silk but there also were no sign of stress or grain. The double-forte, triple-forte chords were forceful and compelling. The semiquaver and thirty-second note runs were crystal clear. Sarah Chang's seamless bowing was lyrical. Dotted rhythms were lively and bouncy and nicely separated from the intricate orchestral embroidery. Here I found the programmable upsampling feature of the Philips DVP9000S most accommodating. I set it to 44.1Hz for more low-octave punch in The Puccini Album and to DSD for layered images in the R. Strauss Violin Concerto. The Facette is capable of 40Hz bass extension at F3 but very few amps have ever traveled down that far. When I switched back to my Audio Zone Pre-T1 + NuForce Ref 9 combo just to compare, textures were notably finer and the upper octaves were more pearlescent and smoother. Yet somehow the bass was not as deep as with the Mouse and even the midrange was not as rich and warm. I suspected this was due to the passive preamp. I connected the Mouse to the Audio Zone and verified that: textures became more refined but the bass got shaved off a little. Imaging consolidated and focus sharpened. Hooking up the Dared SL2000A tube preamp instead reclaimed bass extension and enriched harmonics. Comparisons can be cruel but you needn't be ruthless with your choices. The Mouse allows you to mix colors on your sonic palette with different preamps. But I have to confess, I am very much satisfied with the Mouse on its own. I know something might be missing but I don't actually miss anything. It's the overall music making that wins my heart, not the trivial sonic attributes. To be honest, I never expected the Mouse to drive the Facette so competently. It reminded me of what Jay said in his emails: "The clipping level is now based on the higher rail voltage of the TP2050, in the case of the Mouse, 30 volts. I've taken this further by using a separate TP2050 for each channel. This gives better bass control and higher current capability for lower impedance loads. The included SMPS is suitable for laser printers and similar products which call for peak power that is considerably higher than average. This fits well with music which has peak demand much higher than average." Encouraged by this finding, I moved to the bigger room where the Mark & Daniel Topaz presided. At 85.5dB and 4-6 ohms impedance, this is the most amp-friendly model in the complete M&D lineup so I had high hopes. 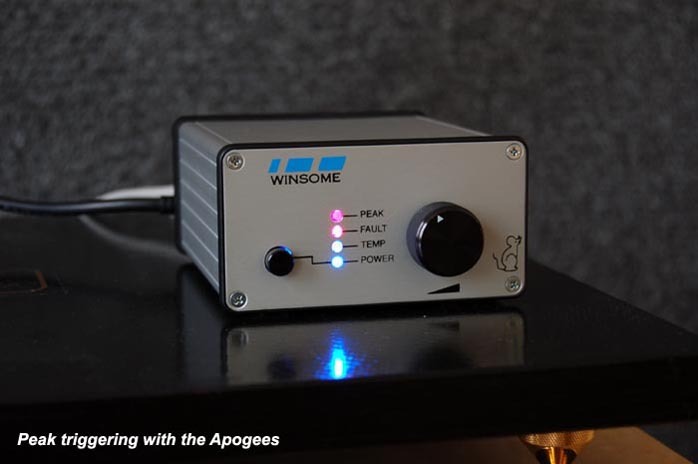 My audition result was published already in the Topaz review: "Again the Winsome Labs Mouse produced the greatest marvel of all. Thanks to the lighter cone mass and higher magnet strength of the Topaz to speed up piston reaction and efficiency, the Mouse was able to pin down everything and all fell snugly into place. Accurate timing of phrase and rhythm, tight control of bass and articulation of details - you name it, it was delivered. Bearing in mind how the Mouse is humbly rated at 33/45wpc at 8/4 ohms while achieving 0.05% THD, the fact that it can drive the Topaz effortlessly and eloquently speaks a lot for itself as well as for the speakers. Both have come forward to forge an alliance of excellence, a coalition of non-conformists." Then I thought of my Apogee Centaur Minor. On paper, this ribbon/cone-hybrid has the same sensitivity and impedance specs as the Facette. But Apogees are notorious for bringing amps down to their knees. I cautiously dialed the volume up to 12 o'clock and anxiously waited for the CD to load. Alas, it didn't work. The vibrant orchestral introduction of R. Strauss' Violin Concerto triggered the top two red LEDs: peak and fault alarm! The right channel mumbled some unclear sound. The left channel was mute. Did I kill the Mouse or the Apogee? I reconnected the Apogees to the Symphonic Line. Thank heaven, they were unhurt and alive. I reconnected the Mouse to the Sapphires in the corners. I didn't kill the Mouse either. Other Tripath amps might have rested in peace. On that note, I have to give Jay another thumbs up for making the Mouse fault proof. First I bi-amped the JMlab Micron with two Mice and then the Klipsch Synergy F2. It was fabulous as expected but no challenge. I wanted to push the Mice even farther. Moving up the ladder, I configured two Mice for vertical bi-amping to drive the 83.5dB/3-6 ohms Mark & Daniel Sapphire. You already knew the outcome from an earlier e-mail quote. As I mentioned to Jay, "it sounded excellent". Allow me to quote from the Sapphire review: "Even with a monstrous concert like Vangelis' Mythodea, the Mice drove the Sapphire through every sharp corner with agility. I was pleasantly shocked. I didn't use any preamp. With volume knobs dialed to 12 o'clock, the Mice were almost as potent as the NuForce, delivering nearly the same quantity and quality of bass. I bombarded them with the most unforgiving huge symphonic works and brass ensemble pieces without signs of stress or clipping, maintaining clarity and composure throughout. With Mythodea and Brass Carmina Burana, the tonal spectrum was surprisingly well balanced. I merely wished for a bit more midrange presence. It was not hollow or sucked out but a little more oomph in the bassoons and tuba and a darker shade in the lower strings would have been even nicer. With the Beethoven Sonatas it was perhaps less sweet and suave in the upper octaves but not substantially so. Most surprising of all, the breath and depth of the soundstage and the layering details were so comparable to the NuForce amps that I had a hard time distinguishing the two. The three instruments in Arensky's Piano Trio were nicely separated and well proportioned. The solo voice rising above the layered chorus in Grieg's Choral Music was exactly what we'd call pinpoint imaging." I used to say that the Trends TA-10 is a scaled-down miniature NuForce but the Mouse is really the unlikely challenger to pose a real threat to that award-winning class D amp. Condescending as it might sound, it is not exaggerated at all. Okay, the NuForce can drive my Apogee without difficulty and the Mouse cannot. With the Sapphire however, I'm literally overjoyed. How much more does the Mouse need to prove before being recognized for the big cat it is? I almost forgot to mention that Jay had kindly and speedily agreed to my request for yet two more Mice to complete a 5-channel setup. Before that, I had another idea for three Mice. It's been reported elsewhere that the Mark & Daniel Maximus-Monitor has blown out amps. Human error, design fault or simply ill-intentioned rumors? I decided to brave audio inferno by conducting my own experiment. In my audio lab, the first Mouse was strapped to the bi-wire posts of one Maximus-Monitor, the second Mouse to the other for vertical bi-amping, the third Mouse drove the two Omni-Harmonizers. In other words, I turned the M&D speaker system into a quasi-three way tri-amped. With the assistance of multiple Y-splitters, I had sufficient signal leads to feed all three Mice. The Omni-Harmonizers have an impedance of 13 ohms and shouldn't be difficult to drive. It's the 4 ohms of the Maximus-Monitor that are likely to pose problems. To make sure I had enough signal strength, I added the active KingRex preamp as buffer. After listening through Falla's Seven Popular Spanish Songs, I knew my concerns were uncalled for. The hauntingly beautiful "Asturiana" was captivating. The festive fireworks of "Jota" were blazingly colorful. The explosive outcry of love sickness in "Polo" was painfully involving. Everything had immediacy and presence. The Maximus-Monitor demands a high-current power amp of a recommended 100wpc minimum but what do we have here? Three not-blind mice! I kept playing through high-energy orchestral pieces that should have squeezed out every drop of current as they gushed through the signal path. Then I removed the KingRex preamp and let the three Mice run on their own. Drivability was not diminished one iota. Perhaps things now packed yet more punch and immediacy. 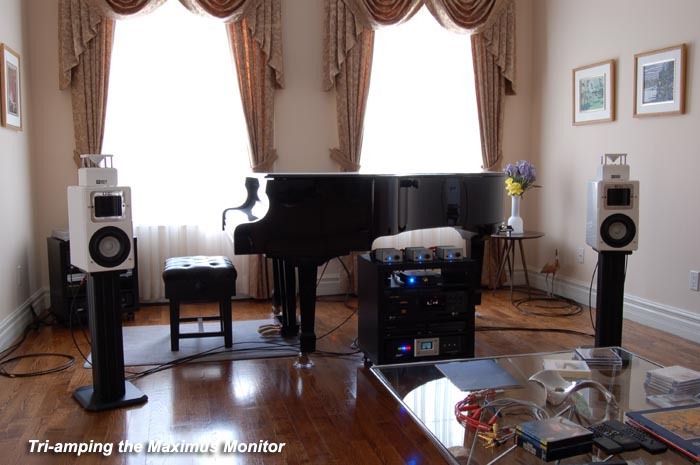 With the F3 presence of solid 40Hz bass compliments of the Maximus-Monitor's 6.5" SX woofer and 35,000Hz ultra-high frequency extension of the Omni-Harmonizer, the fiery passion and pianistic dexterity in The Puccini Album all came to life. Hammer and damper actions contrasted vividly. I could feel the subtle interactions between felted wood and brass wires as the hammers mercilessly attacked the strings, sending off thunderous harmonious oscillations; or as the dampers deftly silenced them, bringing the vibrations to a sudden null. All the time, the volume knobs of the three Mice sat at 12 o'clock for enough sound pressure and sonic realism to give me a sense of being there. If the Maximus-Monitors are really the amp slayers some proclaim, this murderously harsh experiment would have electrocuted the Mice. I reconnected the Maximus-Monitors and Omni-Harmonizers to the NuForce P-9 + Reference 9 SE + Reference 9 V2 in bi-amp array just to gauge how well the Mice had actually performed. You could say that the NuForce had the definitive upper hand in textural refinement and airy ambience. Using Verdi's Eight Romanze as a point of comparison, the woodwind, percussion and harp in "Il poveretto" (The beggar) and "Deh, pietoso, oh addolorata" (O lady of sorrow) seemed more sparkly, delicately contrasting against the suave strings. However, in terms of driving such demanding speakers, the Mice scored just as high. From what I could hear, potency, soundstage, quantity and quality of bass and coherence of the tonal spectrum were very much on par. The poetic tranquility in "Il tramonto" (Sunset) and dramatic tension in "Brindisi" (A Toast) were just as moving. And most importantly, the Mice gave me the same sense of soundstage width and depth, in which the solo tenor and full orchestra were finely balanced in perfect proportion and separation. executed so well with laser-cut precision in 2-channel mode can now be scaled to five channels without any loss in translation. The Norwegian label 2L, which also advocates and is committed to multi-channel SACD, claim that "where mono is black and white, stereo is a Polaroid snapshot and surround is the real flesh". I'm not so sure about the Polaroid quote but multi-channel is definitely more holographically explicit and therefore requires less imagination on the listener's part. With the Mark & Daniel and Winsome Labs tour de force, such explicit sonic holograms become clearly palpable. With Grieg's Choral Music [2L 45], my listening room, despite its earthly dimensions, was sonically transformed into a sublime Norwegian church. Whether I was sitting or standing, I could feel layers of vocalized harmonies that swathed around me and mounting into a dome-shaped ascension above me. All these were illusions of course but 2-channel was never that close to incredulity. love. Every piece is on a grander scale and imbued with deeper sentiments. And the Winsome/M&D partnership really heightens the dramatic tension and sonic aesthetics. 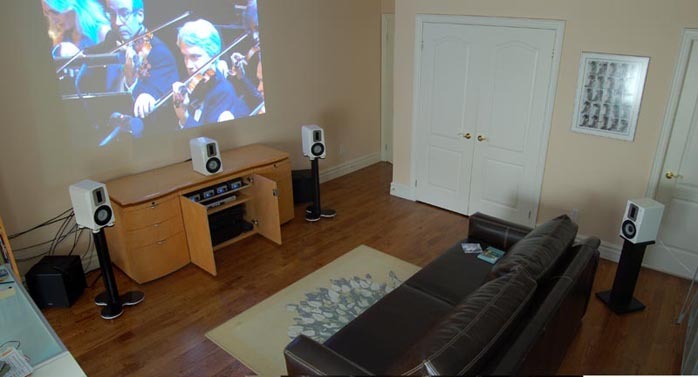 Not only can the sound quality in a home theater now be uncompromising and fit for pure 2-channel and 5-channel audio gratification, the necessary space for the speakers and amps is substantially reduced. In fact, the cool-running little Mice fit so perfectly in my credenza that I'm afraid to say, they are not going anywhere after this audition. I'd better prepare some explanations to my wife when the next monthly bank statement arrives. 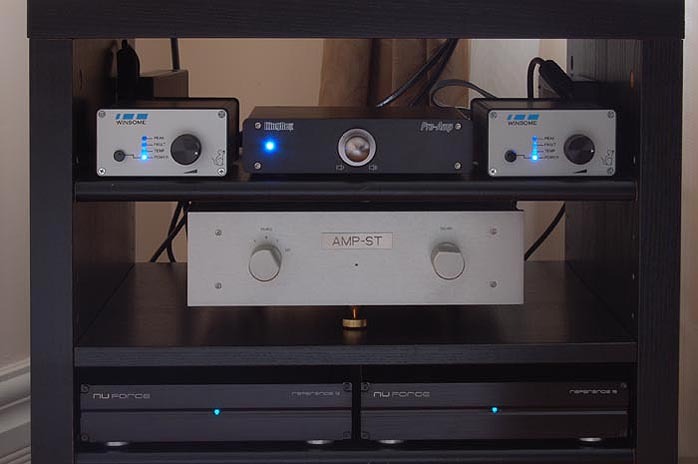 Perhaps in the future I will still try a full NuForce system to drive my beloved Sapphire/Topaz 5-channel setup. For now, at less than the price of the Reference 8.5 V2 that covers merely two channels and no preamp yet, I have four mighty Mice to drive all five channels. I am happy to let that procrastinate forever. The successful formula of Red Wine Audio's Signature 30 and 70 is purification via SLA battery. SLA as we all know means sealed lead acid. Here it might have found another meaning: supplemental line alternative. 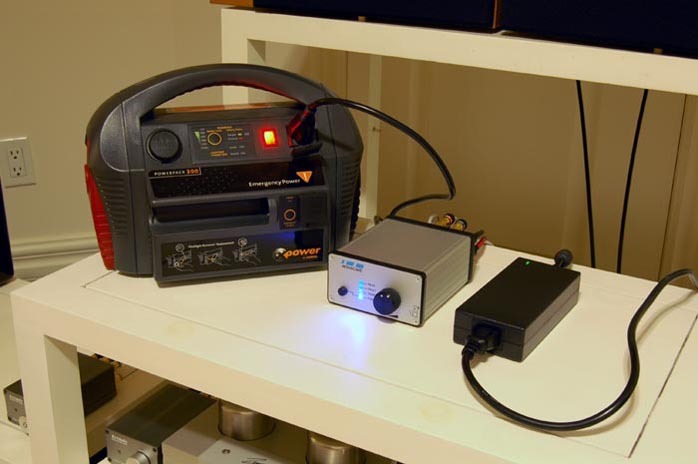 Last year, I used an emergency power SLA 12-volt battery, the Xantrex PowerPack 300EP, to power the Trends TA-10. I attested to considerable sonic improvements in imaging and layering. The slight regret was the trade-off in bass due to the physical limitation of 2AH capacity. (3AH would have been better.) It never occurred to me that the same battery might be of any use to the Mouse since that operates on 30volts/3amps. Somehow I came up with the stupid idea of assimilating 'off-the-grid' power by plugging the Mouse, or rather the SMPA of the Mouse, into the 120-volt AC inverter of the PowerPack 300EP. Last year I had already been stupid enough to try exactly that with the TA-10 but it strongly protested with a loud grumbling hum. Being one year older and stupider yet, I tried it again. This time, the Mouse didn't complain. At all. To my surprise, I thought I heard some improvement. As I noted down on auditioning the Mouse off-the-grid on the Facette: "I hear purification, like entering a dust-free world. Imaging is distilled and refined." And the PowerPack cost me less than $100. Stupidity multiplied fast. I took two PowerPacks to power up two Mice bi-amping the Maximus-Monitor. I thought I heard the same kind of improvement. I was smart enough to warn myself: No, it could not be true. Was I the victim of psycho audio hallucinations? I was sure there was no deterioration in sonic quality. At least the bass control of the M&D speakers was just as tight as before. Even if this worked, according to Jay the Mouse consumes 110 watts but according to the Xantrex manual, 110-watt appliances should last only 90 minutes on a full charge. Yet I must have played through 8 CDs after the SLA batteries were topped off. I was confused. I emailed Jay: "Power consumption of the Mouse is 110W at full output, 8W in stand-by. Full output means what, not necessarily with the volume knob dialled to max? If loud orchestral climaxes reach peak power, that's full output too even if the volume sits at 12 o'clock? And standby? If volume is dialed to max without signal, is that still consuming only 8 watts? 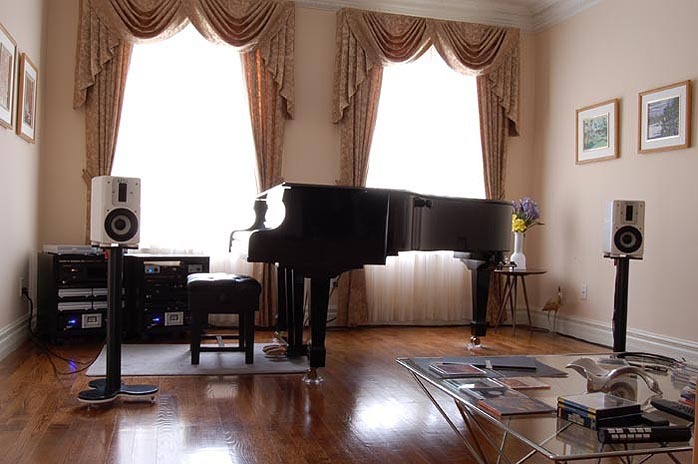 I'm trying to estimate the power consumption if I keep the volume knob at 12 o'clock and play a normal classical piece that has loud and quiet passages." Good questions! But you bring out the engineer in me. There are four factors to consider - the standby consumption of the SMPS, the standby consumption of the amplifier, the efficiency of the SMPS and the efficiency of the amplifier. Here's how they stack up under different conditions. Condition 1: SMPS plugged into mains, amplifier powered off. Here we deal with only the standby consumption of the SMPS. This varies with input voltage but is on the order of 2.5 to five watts. At higher mains voltages it consumes slightly more standby power, so roughly three watts with 120V mains and five with 240V mains. Condition 2: Amplifier powered on, no audio output. Either with the volume all the way down or cranked up with a quiet input, this makes no difference. Consumption varies slightly between samples but it is roughly 90 milliamperes at 30 volts, just under three watts. The SMPS is roughly 90% efficient, so this plus the standby pull from the SMPS gives a consumption of six to eight watts depending on the line voltage. This is the eight-watt standby figure. Condition 3: Playing music. 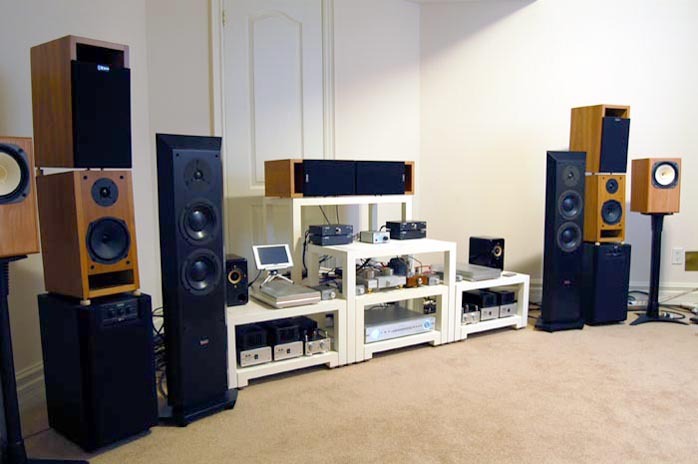 This is more complex as music is dynamic, bulk storage capacitors in the SMPS and amplifier tend to smooth the peaks, speaker load impedances aren't constant and other factors. The amplifier is 90% efficient (closer to 93% measured but the spec sheet says 90) as is the SMPS. Power consumption is going to be roughly 1.2 times the actual power delivered to the load, with a minimum of the 6 to 8 watts standby. If you were to put a wattmeter on it, you would find that at painfully loud levels of real music, actual consumption is well under 50 watts (as is the real *average* power delivered to your speakers). A loud orchestral climax, if not sustained, will actually exceed the peak power rating with loads below 6 ohms, but the SMPS is only capable of 100 watts output sustained. This discrepancy is why you will often see consumer gear specified with a much higher "peak music power" output than the wattage rating that it pulls from the power line, clearly impossible to achieve steady-state. You can get 75 watts into low-impedance loads if you only drive one channel. 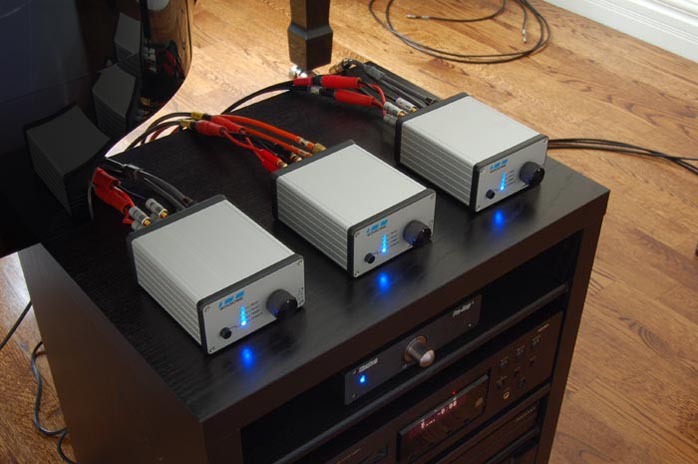 The supplied power supply is the limiting factor as it can only deliver 100 watts to each amplifier. That's what makes your vertical bi-amp setup perform so well. The energy in the high-frequency part of the musical spectrum is around 1/10th of that in the bass registers. 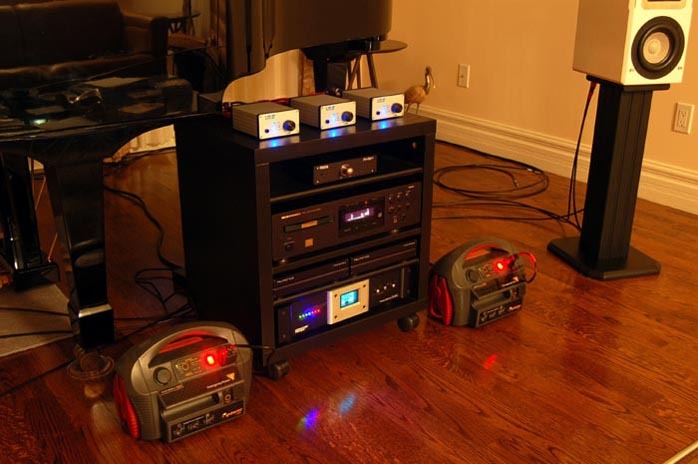 Each amplifier can deliver 75 watts to the woofer and around seven to the tweeter. Condition 4: Bench testing. Strap a pair of load resistors on it and crank up sine waves until it clips! 45wpc to a pair of 4-ohm loads. Here the standby power figures disappear as efficiencies are specified at full output so the standby losses are rolled into the total consumption. The extra 20 watts are the efficiency losses in the SMPS and amplifier, total consumption 110 watts steady-state. So much for the fancy math. With real music including the occasional orchestral loud climax that just tickles the "peak" light and nominal four-ohm speakers (even if they dip lower at certain frequencies), the average power consumption will be somewhere around 25 to 50 watts depending on the dynamic range of the music. If you measure it at the exact instant of the peak, it could go as high as 110 watts. Compressed modern Pop CDs will have higher average power consumption if played loud. So it's fair to say that the Mouse consumes 50 watts on average, still a very respectable figure for its kind of potency and performance. I have to thank Jay for his time in responding in such a professional fashion. Not only did that solve a lot of my puzzles, it also answered a lot of unspoken questions about why the Mice drive the Maximus-Monitor so well. I did not want to let him know what I did with the SLA battery, worrying that he might laugh at my stupidity. But eventually I asked anyway and told him that I seemed to hear some improvements. I also asked if he had any experience with Red Wine Audio. It surprises me that the unit would sound better that way than when plugged directly into the power line. The SMPS does a very good job of isolating from line transients and a non-sinusoidal inverter will have more "hash" than a typical utility outlet. I actually have experimented with a SLA supply for the Mouse but haven't put it into production. I found that the extra headroom of a 30-volt rail was very beneficial. Power is proportional to the square of the voltage into the same load. We exchanged emails until almost 2AM Toronto time. Although I did not have a chance to compare it with a Red Wine Audio Signature 70 which uses the same chipset, I couldn't stop thinking that the Mouse should sound at least as good. It might lack the sonic purity of a 24-volt SLA battery power but could make it up elsewhere with the more potent 30-volt rail. I woke up the next morning and started another round of on-the-grid off-the grid stand-offs with the Dynaudio. Whereas I found on-the-grid to pack a sliver more punch, I had to stand by my earlier verdict. The brilliant orchestration of Falla's Popular Spanish Songs seemed coated with a subtle layer of sheen. Castanet, tambourine and guitar in "Jota" accentuated the rhythm with a certain glazing flair. Strings appeared to be more airy, more uplifting in Rameau's Orchestral Suites too. 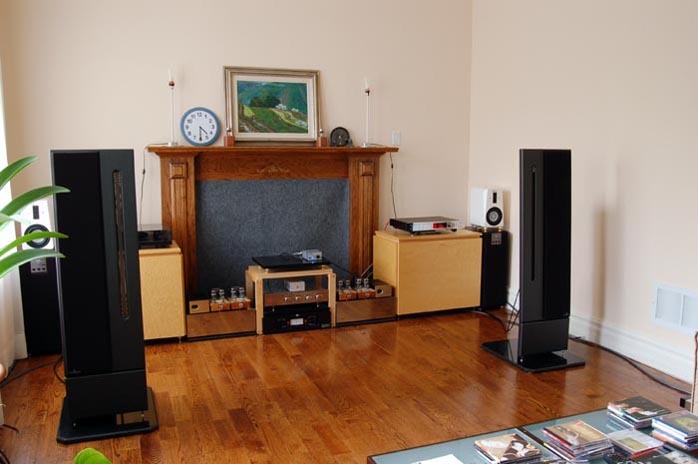 They sounded as if a pair of super-high tweeters were present, augmenting the bowing action and rendering the micro dynamics more discernable. Still an illusion? Or was it just a subtle ground loop issue that could be solved with a Radio Shack grounding adapter as Jay suspected? None of my digital sources have ground posts. Like all great suspense stories, it's always more intriguing to leave the mystery unsolved. This review was the last chapter in my Tripath triptych. 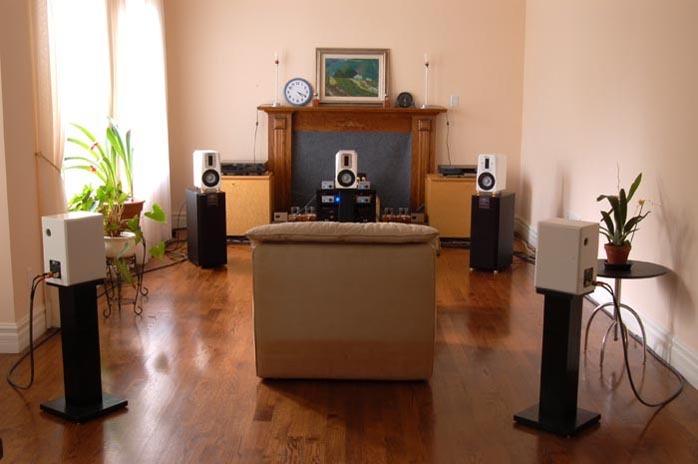 Three distinguished class T amps have opened my eyes and ears in different ways. The Trends TA-10 offers the best price/performance ratio. 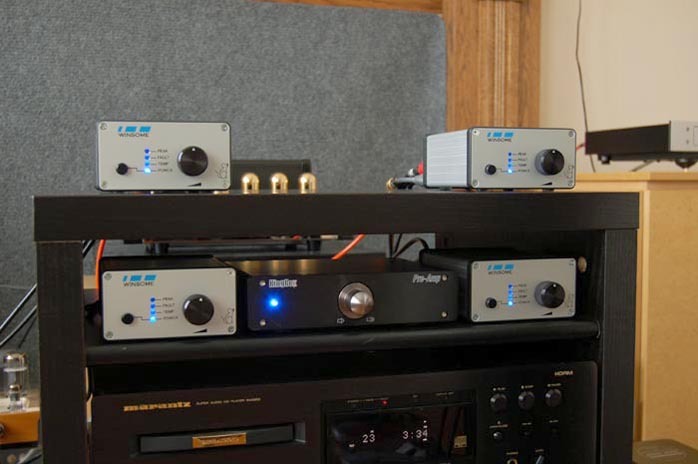 The KingRex T20/T20U emulates tube amps in the most convincing manner and their USB/DAC is a breakthrough. The Winsome Labs Mouse has maintained an affordable price and yet pushed the performance envelope by re-thinking the entire Tripath proposition. Jay Hennigan the designer has performed extensive R&D with the little box and given it a big heart. Don't let the conservative specs mislead you. With the Mouse, your choice of speaker is no longer bound by the high-efficiency type. It drives like a Beemer and consumes like a Prius. My heartfelt congratulations to the Winsome Labs Mouse. It gets a Blue Moon Award for being the compact muscle amp in the class T category. Quality of packing: Though more like online shopping than factory packing, it's carton box generously padded with double bubble bags providing more than adequate protection for cross-country shipping. Reusability of packing: Reusable as long as you don't step on the box or sit on the bubble bags. Ease of unpacking/repacking: A no-brainer. Condition of component received: Immaculate. Completeness of delivery: Included power cord and AC/DC adapter, operation manual. Quality of owner's manual: A straight 3-page text document but the content is extremely detailed and useful. The 9-page kit assembly manual is very detailed and clear. Website comments: Informative and professional. Warranty: 1 year parts and labor. 30-day return policy on assembled amps and kits. Unassembled kits can be returned for refund or factory assembly (for a reasonable fee). Full details on website. Global distribution: Direct online sales. Human interactions: Professional and friendly, timely responses to questions, the most forthcoming about technical matters yet in my experience. Other: The Mouse is solidly built. Fully assembled amp users should not remove the bottom panel just to view the two TP2050 chips. The heat-dissipating gel can get messy. Pricing: Hard to beat for this level of performance. Application conditions: Follow connection markings on the rear panel! The output is differential and balanced, meaning both speaker terminals are driven and must not be connected to ground or to each other. Care must be taken when using speaker switches to ensure that the common terminals are not grounded. Never connect to an active subwoofer's low level input. Final comments & suggestions: Any feedback on off-the-grid is most welcome. We would like to express our greatest appreciation and thanks to David Kan and 6moons for the thorough and comprehensive review. It is obvious that substantial time and effort went into it. David's thoughtful questions and attention to detail show that he is truly concerned with getting things right, and his passion for all things musical shows. The "Mouse" name came about because of the size and weight of the unit. It somehow seemed more appropriate than a model number. As to the kits, this option is a throwback to our enjoyment of kit-building many years ago. Both of us were fans of Heathkit and built many of their projects. While the surface-mount parts are pre-assembled, readers are cautioned not to use the kit as a means to learn to solder for the first time. Experienced DIYers should have no trouble. Developing and producing the Mouse amplifier has been a very enjoyable project for us. We're delighted that it is enabling our customers to enjoy listening to music as well.